YUM!!! I’m so excited you have a link to the bread recipe. That makes the sandwich and it’s very hard to find here in Texas. 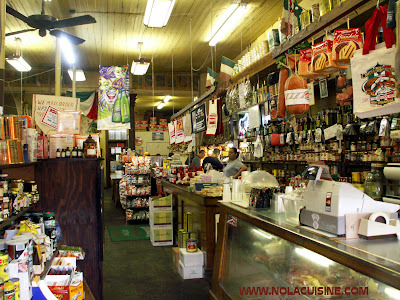 Central Grocery is absolutely one of my favorite places in New Orleans!!! Once again, great pictures. Sheesh…you’re killin’ me here in Cleveland! Your posts, especially this one, make me homesick for N’Awlins. Thanks for the great pics and posts. I cannot get enough of the olive salad in there — that is what makes the sandwich for me! I’m so thankful I still have one relative in Greater NO. A real muffelletta in a must on every visit. Northeast Ohio never heard of them and my homemade attempts only make me long for the real thing even more. The picture on the riverwalk brings back distant, and more recent memories…we went to JazzFest this year. For the record, muffulettas are great for breakfast (at 10:30 a.m.), and go REALLY well with a couple of Bloody Marys from the bar at Tujague’s just down the street. Do you know what days in the week Central Grocery is closed? Central used to be great, but they’ve cut back on the fillings so much over the years they’re not so great any more. Try Serio’s Deli right off Canal St. for a wonderful muffuletta. With all this, something should be said for the captain of the store, Frank Tusa. He has kept it steady, and high, and yummy. Just got back from NOLA a few hours ago. 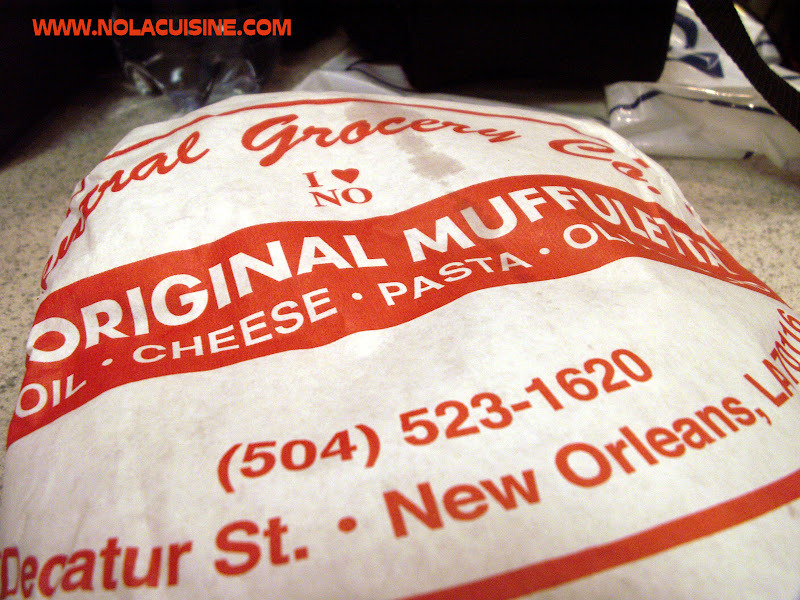 Bought 2 Central Grocery muffalettas right before we left to come back to Chicago. As a matter fact, I just finished half of one while reading this link. This is truly the most amazing sandwich I have ever had! I love Muffulettas!!!!! I stopped bye this past summer to get one. (I live in Mo.) They said you can call & have one shipped to you. Awsome!!! 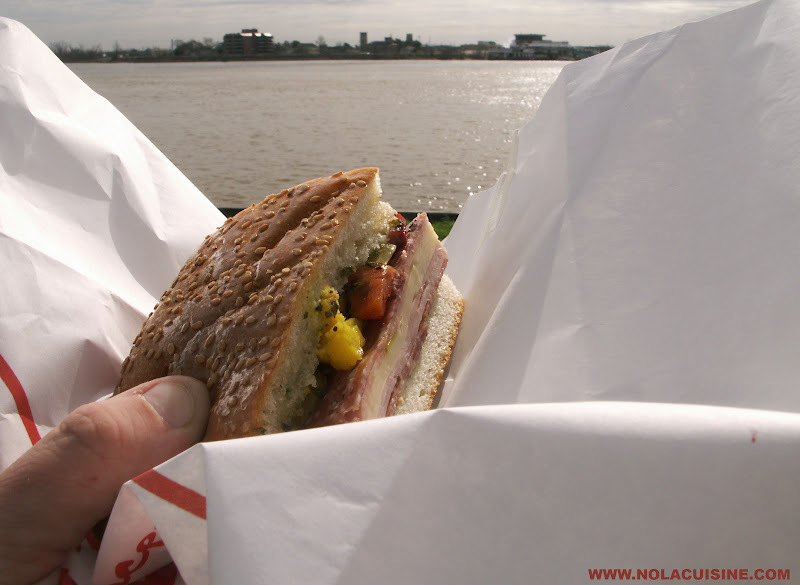 Jackson Square is also a great place to enjoy a muffuletta while you people watch. The only other eating experience I have had in New Orleans that was even close to this was a burger at Port of Call. New Orleans is absolutely one-of-a-kind and I can’t wait until I am able to visit, and eat, again. Thank you for a post that brings back so many fantastic memories! 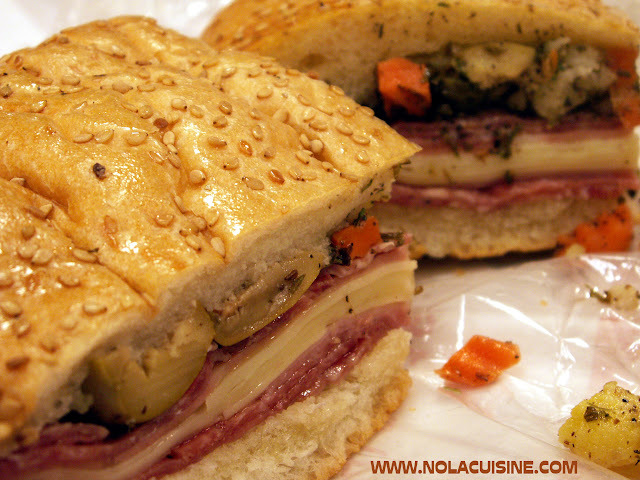 Pingback: Muffuletta Sliders « Red Beans and Eric… err rice! CG is truly one of the few remaining places in New Orleans (no not N’awlins, only tourist call it that) where things are exactly like they always have been. As other places change hands over the years and the new owners think they can improve on success most of the truly unique food treasures have vanished. CG is really the only Muff i consider pure and still the best. Thanks for the bread recipe, even though i am not an “oven chef” but more of a “stove chef” i will have to give it a try since nothing even close is available to us expats in Florida.